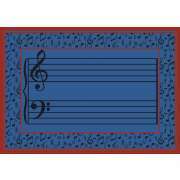 Purchase Music Rugs For Your School. Shop Now! What kind of carpet should you get for the music classroom? 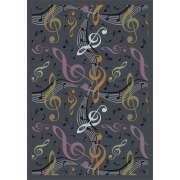 Music rugs have beautiful designs that can enhance visual appeal and be used as instructional tools. With a selection of styles in both vibrant and subdued tones, you can find a great choice for classrooms, band rooms, practice spaces, performance spaces and more. When it comes to music education, a music carpet can really come in handy. While posters and handouts are nice, they aren’t nearly as appealing to youngsters as a familiar design. Little ones will just love picking out the symbols that they are learning in class and playing all sorts of games based around the design of the classroom carpet. Where should you put a music rug? There are lots of spaces where a music carpet can fit in. If you have a music corner in your early-childhood or preschool classroom, that is one good spot. You might even choose onr of these patterns as your main classroom carpet. Of course if there is a separate room for music instruction that is another great place. Music teachers will just love having a theme rug which young learners can sit around for lessons as they enjoy singing and learning together. When music education is given the place it deserves, students benefit tremendously. To start children off young for a lifetime of music appreciation, you want to make sure that the subject is presented in a fun, exciting and creative way. Basing lessons off of music area rugs draws students into the subject, and allows complex concepts to be presented in an engaging and straightforward way. You can talk about simple and complex rhythms based on the carpet symbols, as well as many other topics that are important to the subject. What activities can you do with a music carpet? 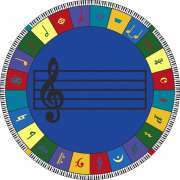 There are lots of fun games and exercises that can be done based on a music rug. The graphics can be used to reinforce lessons when students are asked to identify specific symbols. Little ones will enjoy looking for music symbols on the carpet and naming them. Teachers can also facilitate games where students are asked to do a certain action or activity based on which symbol they are sitting on. 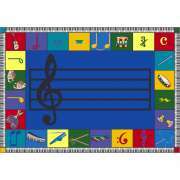 One music classroom rug design that can be used for games is the musical chairs design. The fun, eye-catching graphics can be used for color matching and letter matching activities. With pictures of individual seats around the border, you can even facilitate a game of musical chairs without having to move around any furniture at all. What kind of music rugs can you get? Our music rugs for classrooms come in a variety of shapes, sizes and designs. Whether you just want to fit a small music corner or the middle of a large room, we have some excellent options. Choose from attractive, vibrant colors that make music exciting or more subdued tones that will fit in a more serious atmosphere such as the auditorium, band room or other performance space.